It's good that these people now have an income. It's sad and disturbing how their income came about. If this disaster doesn't finally force serious changes, then God help us all because what else is it going to take for the 'powers that be' to finally do the right things for our planet. this has got to be a serious wake up call for everyone. Thank God we didn't elect Drill, Baby, Drill. The day Sarah Palin gets elected to the White House is when it is truly over. It is good BP is giving people jobs, but it doesn't change what they have done, and it isn't going to make people forget they are dirtbag Big Oil who now are on a damage control mission of their own that isn't related to oil. well someone needs to clean it up! 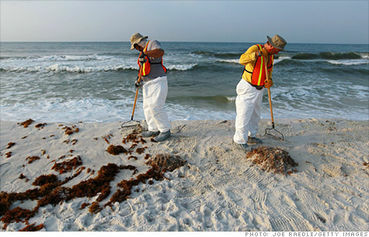 WHAT KIND OF PROTECTIVE GEAR IS BEING SUPPLIED BY BP FOR THE WORKERS?? THEY ARE COMING INTO CONTACT WITH KNOWN CARCINOGENS AND DEAD & DECAYING MATTER,,,,,FISHERMAN ARE BEING OVERCOME BY THE FUMES-- TOXINS ARE EVERYWHERE......HOW IS BP ADDRESSING THE ISSUE ??????? I wonder how many survisors will be hired at $32 per hour to stand around and lean on shovels. More worker bees and less queens! Big Oil who now are on a damage control mission of their own that isn't related to oil. I saw some pathetic lazy clean-up workers who took more breaks and very little action to clean up, hope the rest of the crew is not like this bad bunch of loosers. We need the news media watching this clean up very closely or it will never be done, don't trust Obama or BP until they are both on the same page. We have a pres. who has never talked with BP, what kind of educated person is this? I don't think Obama has the expertise to run this country. He is too committed to socialistic idealogy and transformation of America into a Marxist state. Wake up Americans before it is too late.